Do you ever wonder who is your computer talking to? Your browser is not the only application that sends data online. Your word processor might be calling home; a file recovery utility might be talking to its mother ship, and even the Windows services themselves may surprise you. These are not necessarily harmful actions, but it is worth knowing them. There are many applications that allow us to control & monitor the activity of Internet applications as well as all the connections and traffic they generate. Many of them are free and others paid, GlassWire is a free and beautiful utility that allow us to keep an exhaustive control of network traffic. GlassWire also works as Firewall allowing the user to block the Internet access of any application at any time. It also applies an additional layer of protection against possible malware, however, this application is not an antivirus, so developers recommend using additional antivirus and anti-malware tools since its protection layer is different from the activity of these applications. One of the most important things about GlassWire is that it is beautiful. This is not a minor detail: for many users, network security is both discouraging and tedious. Having a tool that is fun to open and look at during the day makes a big difference. The graphic scrolls in real time, and there is a zoom slider at the bottom of the window that allows you to see longer periods of time at a glance. Checking What is causing increase in traffic? When you see the traffic suddenly increasing, you can easily drill and find out exactly what application (s) on your computer caused that peak and with which Internet servers they were communicating. The graph also makes it easy to distinguish outgoing traffic (charges, which are shown in yellow) and incoming traffic (downloads, which are shown in pink). You can zoom out, and filter by application. To get a clearer idea of ​​how your network traffic looks, you can zoom out to show three hours, 24 hours or a whole week of network activity. There is no delay when you do this: all filtering operations are instantaneous. The graphic then allows you to filter the activity by application. 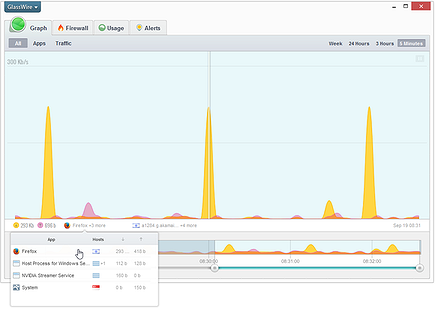 For example, what does Rdio network traffic look like? How much data do you download during a day of listening and use the network constantly or in a few moments? GlassWire makes it easy and fun to determine. You can then filter the activity of the network per protocol. This may reveal some surprising information in itself. For example, I use a webmail client: I do not have a traditional email client such as Outlook, so I did not expect to see any SMTP activity on my computer. GlassWire reminded me that one of my applications sends data to the Internet through SMTP, and it is (dramatic background music) … not an email client. Once we install the GlassWire on the computer, it will begin to register all the traffic that is generated on it. 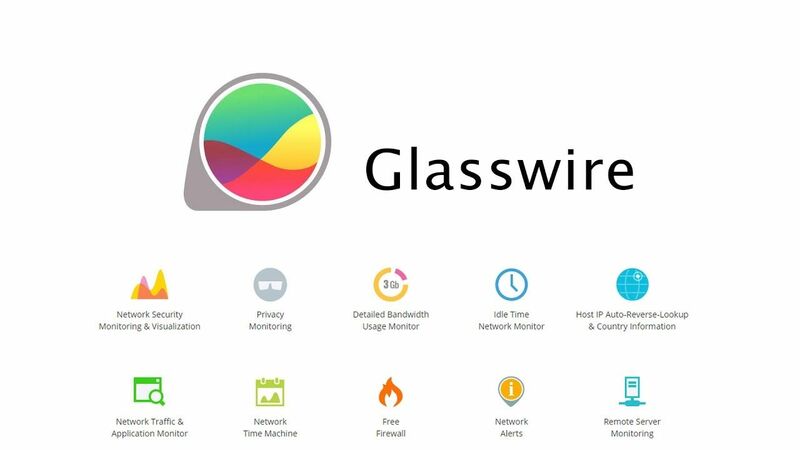 GlassWire shows us a series of notifications each time a new application tries to access the network. We can see these notifications both in the general graphic of the application and in the specific section that we will see later. We can see all the applications with Internet access and filter their individual traffic from the filters that we have in the graphics tab. Do you see an application that you do not want to communicate? It only makes sense that GlassWire also allows you to do something with your new knowledge. And to do that we have the GlassWire builtin firewall. GlassWire has a Firewall that allows us to control the applications that can enter from the Internet to our PC and leave it to the network. The Firewall tab allows you to review the list of all the communicating applications, each with its own thumbnail traffic chart. It also lists what network hosts each application communicates with, and a single click will silence that application forever. If you already use a firewall that you are happy with, you can turn off the integrated GlassWire firewall from this same tab without having to search in the Settings dialog box. This firewall is very easy to use and comes disabled by default. When we activate it, we must make sure that we do not have another firewall enabled in our system (for example, that of a security suite) because if it were, it would not work correctly. The GlassWire firewall works through the Windows firewall, so we must enable the system’s firewall to be able to use it. 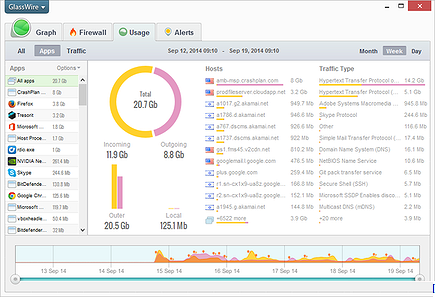 GlassWire allows us to control the use of network in our system at all times. The Usage tab gives you an overview of how much bandwidth your computer uses. The application constantly monitors the activity of all the applications and processes of the system and calculates the generated traffic, both input and output, in order to know the applications that consume the most data and the total consumed. In the same way we can detect suspicious applications or processes that try to connect with an unknown Internet server to detect possible malware. A line chart is useful for tracking traffic over time; but for the accumulated total, something like a pie chart works better. That’s what you’ll find in the Usage tab: A simple and beautiful look at your traffic totals for the day, the week or the month. This tab uses the same zoom slider as the Graph tab, which allows you to choose your own custom durations and zoom in on traffic peaks to see the amount of data consumed and applications. If you use a measured connection, if your ISP claims it has not been using its so-called “unlimited plan” reasonably, the Usage tab offers invaluable totals. The Alerts tab shows what has been going on while you were absent. From there the program will inform us of all the events that have occurred since the software is running as all connected applications and suspicious events. There is all the traffic that is happening when you are not even using the computer. After all, your applications do not need me to be there to communicate. Some may even wait patiently for their time, waiting for the keyboard and mouse to remain inactive for a while, before they start talking to their control servers or their network partners. It is advisable to take a look at this section usually since we can also detect suspicious activity of some applications that should not be connected to a specific server. Advanced users can also have a remote GlassWire server that allows them, for example, to easily monitor the network activity of a server or any other system without the need to be seated in front of it. Like everything else that GlassWire monitors, this is not necessarily nefarious: perhaps your online backup application simply does not want to slow down your connection when you need it. Still, controlling these things is healthy, and that’s what Alerts are for. When you unlock your workstation, GlassWire also displays discrete messages next to the system tray to let you know if something important happened. It is an excellent free tool, both for conventional users who want to have control over all the applications that connect to the Internet and the traffic generated by each and every one of them as well as for those users with limited data connections, for example, in tablets or equipment connected through a 3G modem. 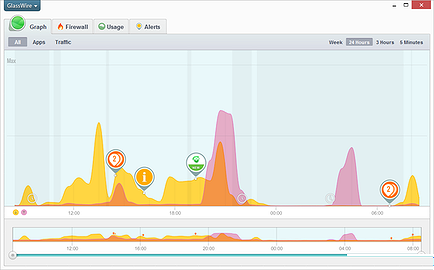 GlassWire not only makes it easy to learn about your network activity: it actually makes it fun . That is his greatest triumph, achieved through a beautiful design and a fast and responsive interface. Unlike many other security applications, there is nothing alarmist about it, and it does not try to sell you anything.